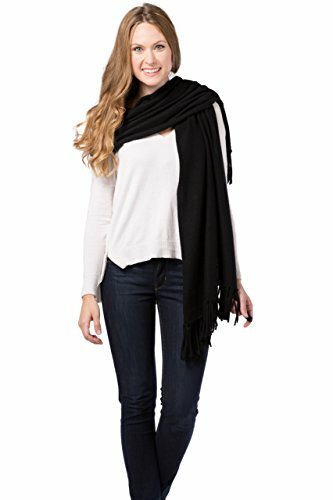 Fishers Finery Women's 100% Cashmere Knit Shawl with Fringe; 78" X 28" (Black) | What Should I Say? This winter, your outfit won't be complete without the Fishers Finery 100% Pure Cashmere Knit Shawl with Fringefrom the Black Label CollectionTM! Keep yourself warm during the cold winter season with this beautifully knitted cashmere shawl. This shawl is made with 100% pure cashmere wool to keep you protected from the harsh winter breeze. This knit cashmere fabric is lightweight and soft, designed to be part of a comfortable and fashionable outfit. It is made with exceptional, durable quality that will keep you warm and cozy. Unlike other cashmere shawls, this classic shawl is pill-resistant and can withstand the harshness that cold weather brings. Use it anytime, anywhere and enjoy being outdoors without worrying about the weather! You can also wear this shawl in various ways! Tie it up on your neck as a French knot or a double-sided twist, use it as a cozy neck wrap, or just drape it over your shoulders as a simple wrap. Give this shawl as a present to your family, friends, coworkers or neighbors this holiday season. It comes already wrapped in our gorgeous custom gift box! HIGH QUALITY FASHION: Our shawl is made from 100% pure, grade A cashmere. Our cashmere is pill resistant, durable and made from dehaired, 2 ply yarn. LUXURIOUS DESIGN: Its all in the details. Our shawl has a classic knit design and measures 78" by 28". We've also added a knotted fringe detail at each end. GREAT GIFT IDEA: This is a great winter or holiday gift for a loved one, co-worker or neighbor! It already comes wrapped in our gorgeous custom Black Label Gift Box too. Spread the gift of warmth during the cold and bitter months of the year!